The first time I saw a capiz chandelier at our local Target (the first two pics) I was smitten. I so…wanted them that I rushed over to check the price and literally fainted. Gradually the sticker shock turned to a ‘wish I could afford it’ feeling. Every time I went to Target I would just go by the lighting section and drool over these. After I saw a three tier one online either on the Crate and Barrel or West Elm site (like the third picture here from EBay) I was sold. I was officially on an affordable capiz chandelier hunt. As luck would have it World Market carried these; they even had a smaller version for table lamps. 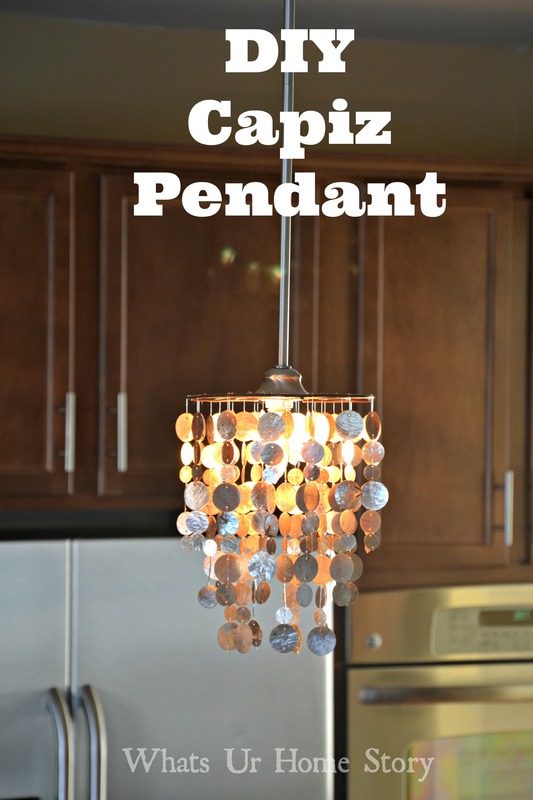 I needed 2 pendants over my kitchen island and the $19.99 a piece tag was music to my ears. So what’s the problem? Getting B on board of course. By the time he warmed up to the idea, the lamps were out of stock at World Market. They had no idea when they would have them back. In desperation I emailed their corporate office and got the same response. For 5 long months I literally checked the store website everyday. Time to move on to Plan B: buy retro capiz chandeliers on EBay/Craiglist, dismantle them, and make them into my kinda chandeliers using wreath rings from Michaels. Sadly there was nothing in my price range (total cost under $40) on EBay/Craiglist. 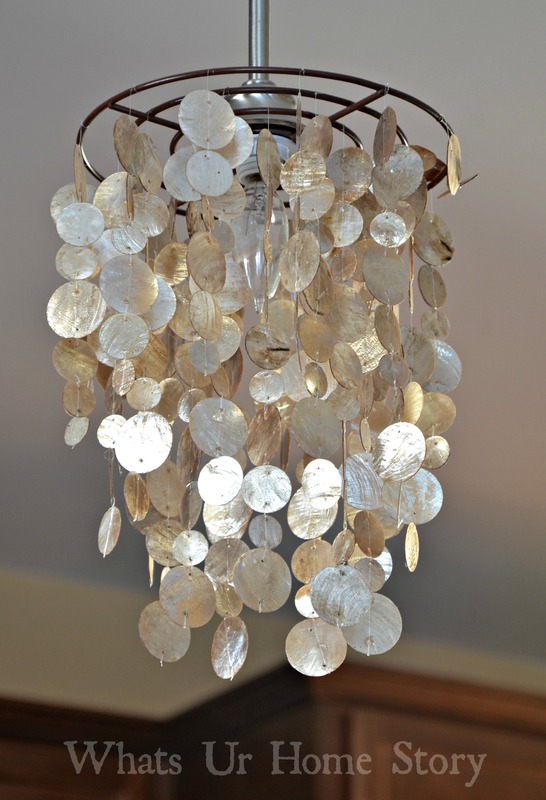 Next up Plan C: buy loose capiz shells on Ebay/Etsy and make my own lamp, again using wreath rings from Michaels. The loose shells in my price range didn’t have holes in them to string them together. Carefully drilling holes in about 130 paper thin shells, not a good idea. Back to Plan A: wait patiently. The hunt stretched into month 6 and finally the doors of decorating heaven opened on me. I saw them back in stock on the website and called our local store to check. Nope, they didn’t have it yet and asked to call back the next day. The next day, nothing. Two days later, I was in luck. After going through their unpacked new inventory (a big shout out to the World Market customer service team) they found 2 in stock. It seems none of the other stores in the area had these. Naha…I didn’t care if I wiped out their entire stock in this area, I NEEDED those. If she heard this my daughter would correct me ‘want not need’ straight out of her economics unit pages . Now, how do I turn these into mini pendant fixtures? With decor DIY comes life lessons usually learnt the hard way (in this case 3 trips each to Home Depot and Lowe’s). It seems there are two ways to hang a pendant, by a clear wire and a clear wire through a rod. Lesson #2: the most common method is to hang them by the clear wire mechanism (like in most fast food restaurants). I hadn’t even noticed this, always assumed that it would be through a rod. I was so intent on making it work that I ended up sawing the inner ring of the capiz fixture so that the bulb attachment would thread through. You can see the sawed off inside edge in the below pics. One more trip to Lowe’s and voila found the right one (can’t seem to find the link online but it is available in store). Again those were the last two at the store in a brushed nickel finish-$15.99 a piece. What is it with me and almost running out of luck on this project? 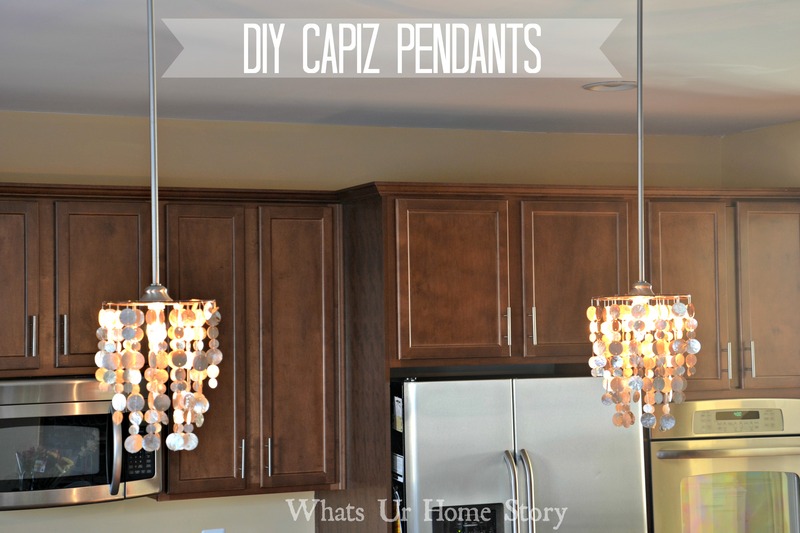 For a cost of $35.98 (each) and a few anxiety attacks I finally got my piece of capiz pendants action. After that episode B labeled me totally crazy. My take on it? So…totally worth it. Even to this day I do a happy dance every time I switch them on. What do you guys think? Are there any other capiz crazy folks out there? Thank You! Loved all the goodies at Lucketts from your tour. I have never been there. Should definitely make a trip up there soon. Hey there, I just hopped over to your web page via StumbleUpon. Not somthing I would generally read, but I liked your views none the less. Thank you for creating some thing worthy of reading. I have had my eye on those very hanging pendants at World Market for months… wasn’t sure where I wanted to use them in my house and had to convince DH that just because they were made from “shell” didn’t mean I was about to cover our home in “beach-y” decor. I love how yours turned out and have decided that we are going to mount ours onto a new headboard (rustic barn wood) that DH is gonna build for us. Who knows, though, I may find a few other places that I “need” them as well. Any idea where to get that round wire thingy? Beautiful! Most of these I have seen look ‘pearlish’… how did you achieve the gold tone? They came like that. These are from world Market.